Well my mom’s birthday is on Easter this year, so I figured since I am giving her gourmet chocolates in her own Easter basket as part of her gift, that this card would be perfect! Can you say yummy Lindt chocolate bunny? I hope it makes it to her. This was going to be for the LSC on SCS then I realized it says no choc. or coffee themed items-oops! I made my own “candy” box. Just cut, scored and folded using the same idea as Alexa’s purse template below! Only ALOT smaller! I used my square punch for the cover. Then adhered the acetate sheet underneath, just like a real candy box. 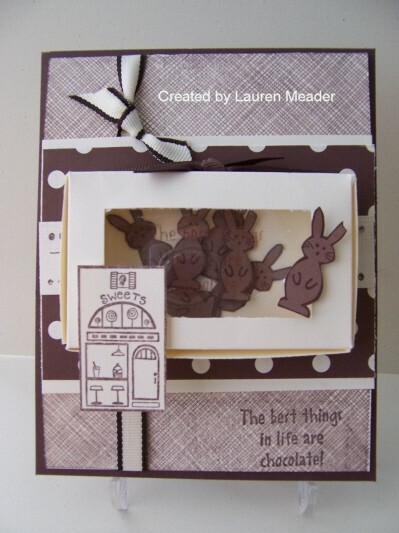 The bunnies are stamped on cocoa cardstock, in choc. chip, the cut out. The box still opens too. Needed to use my weave bkgd I just got from Cornish Heritage Farms. Isn’t it cool? The ribbon is from Jody’s ribbon share. Its my favorite of the Lollipop ribbon. Anyway, finished with my sweet shop stamp by A Muse. Sentiment is from a retired SU set called Oh So Sweet (i think). Paper is Au Chocolat by SU! If you don’t have it you need it! 7 Responses for "Box of Easter Chocolates"
Yea~ It came!! SO glad. Love your card! Glad to see you have a blog now we can all droll over your fabulous works of art!!! You rock! Love this card…the little choclate bunnies are the cutest! Very comfortable and warm – Very comfortable and warm. I live at the beach where night time is damp and cold. Great on the sand or anywhere. Worth every penny. In this modern and fashionable society, people are pursuing for collezione hogan cool, unique, stylish and innovative. This is the choker a small prior up. She sought unbelievable she can wear with the sum total lot. And I believe I do well.